The first example is located in picturesque Manheim, Pennsylvania. Manheim is in the heart of Amish country in Lancaster County. Here, the Manheim Industrial Railroad operates a mile of former NS track. 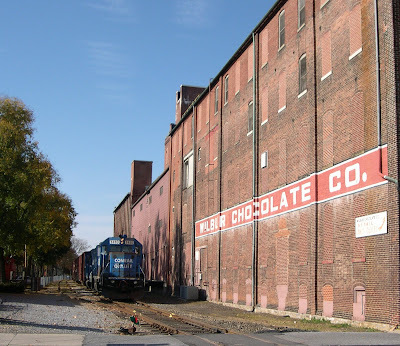 The Manheim Industrial is a division of East Penn Railroad, LLC. 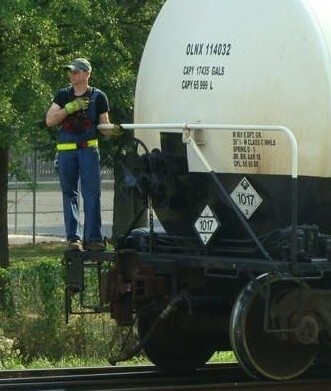 When NS couldn't give Ferrellgas the service they required, East Penn stepped in to handle switching of inbound lpg. A classic minimalist shortline. Ferrell is located on the former Cornwall RR. The former interchange with the RDG was just south in Manheim proper (where the wye is located). Today, a Norfolk Southern local shoves cars of lpg past the wye, dropping them north of E. Steigel Street. East Penn uses a trackmobile to drill loads and empties in and out of Ferrell. Up to 9 or 10 cars may be dropped by NS. Ferrell can unload three cars at a time, so switching gets complicated quickly! Ferrell Gas siding, looking south down the main. NS Interchange is past the crossing ahead. NS local shoving lpg loads onto the interchange. Backing in loads to be dropped north of the wye. There were some neat trackside industrial buildings in Manheim, but they were all razed in 2006. Picking up empties. View is looking north from E. Steigel Street. Now let's travel from PA to MI to look at another small classic: the Lapeer Industrial Railroad. Owned by the Adrian & Blissfield, the Lapeer Industrial operates 1.34 miles of former GTW rails to serve a grain elevator and a manufacturer of adhesives. Here is an AIR PHOTO of the line, which branches off the GTW main near the Lapeer Amtrak station. Note how all switches are trailing point, so there is no need for a runaround. Click HERE for an interesting article about the railroad.